Engineers at Velo Solar designed this ballasated racking system to withstand wind loads up to 120 mph. 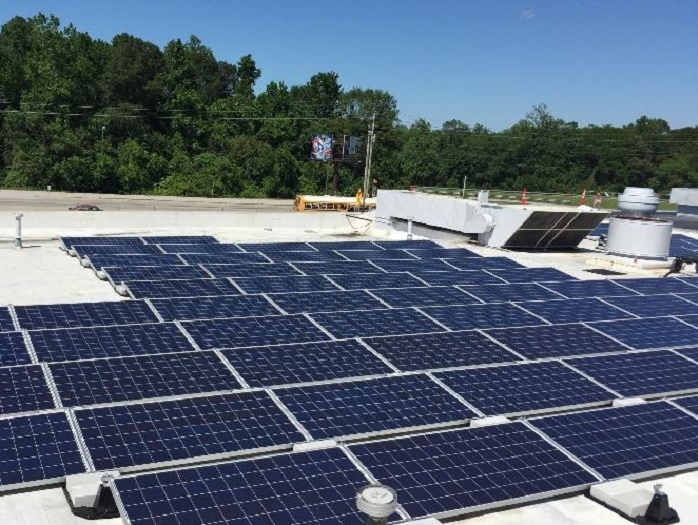 Project goals for Velo Solar include system payback in less than 3 years, receiving the rebate from Duke solar and offset 50 percent of the facilities electric bill. Velo Solar is a leader in the commercial solar installation industry. The company's all engineer management team is focused on simplifying and maximizing the solar installation process. EcoFoot2+ is rated by DNV-GL with an impressive install speed of 13.5 modules per installer-hour. The roof-friendly ballasted system is industry-preferred for its simplicity of installing and transporting and speedy installation. Darlington Raceway was built for NASCAR racing and is located near Darlington, South Carolina. It is nicknamed "The Lady in Black" and "The Track Too Tough to Tame" by many NASCAR fans and drivers and advertised as "A NASCAR Tradition." For the full project case study visit velosolar.com. Learn more about EcoFoot2+ and Ecolibrium Solar.